Sometimes It Is Lupus: You Should Try It! Really? 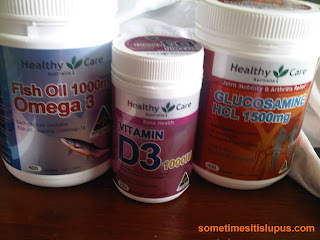 Basic supplements I take, on doctor's recommendation. In 2003, Australians suddenly started talking to their doctors about the over-the counter vitamins and supplements they were taking. That happened as a result of a major health crisis: a major manufacturer of vitamins and supplements was found to be producing tablets which had unreliable strength - some above the stated strength and some weaker than stated. At least one person died as a result of poisoning from a supplement. Almost a decade later, with the reassurance that the Therapeutic Drugs Administration is watching the production of supplements far more closely, I wonder if we are still as aware of what we're swallowing, and if we are still all discussing what we're taking with our doctors and why. I've lost track of how many times people, trying to be helpful, have told me about some supplement or over-the-counter drug they've heard about that they're sure will really help me. There's some sort of belief that something that is "natural" or at least non-prescription must be safer or healthier than our prescribed drugs. Another risk is that supplements and over-the-counter medications could have adverse interactions with the prescription medicines we take. For those of us with chronic illnesses, talking with our doctor about the over-the-counter pills we take is even more important than everyone. We take a lot more prescription medications, so we have a much greater risk of adverse interactions. Our bodies can also be very sensitive to all kinds of things, and we need to be very careful of what we put in them. That being said, there are a number of supplements I do take - because my doctors have told me to. They are probably ones that most people with lupus would also take. My rheumatologist has me taking large amounts of fish oil, as well as daily glucosamine. He also has me take Vitamin D - because it's a vitamin the body makes as a result of sun exposure, and I don't get sun exposure. Unless I take the supplement, my blood tests will always show I am deficient in Vitamin D. The other supplement my rheumatologist tells me to take is folate because I take methotrexate, which depletes the body's store of folate. Beyond that, if my blood tests indicate a need, my GP will sometimes get me to take magnesium, or give me a Vitamin B12 injection.